In These Times 25/10 -- We are Here. We Have Arrived. City of Mexico: We have arrived. Here we are. We are the Indigenous National Congress and Zapatistas who together, salute you. beginning, the government has been at our backs. Sometimes with armed helicopters, sometimes with paramilitaries, sometimes with bomber planes, sometimes with tanks, sometimes with soldiers, sometimes with police, sometimes with offers to buy or sell consciences, sometimes with offers of rendition, sometimes with lies, sometimes with strident declarations, sometimes with forgetfulness, sometimes with expectant silences. Sometimes, times like today, with impotent silences. Because of this the government never sees us, because of this they never hear us. If they would hurry up a little maybe they could reach us. They could see us then, and hear us. They could discover the long and strong horizontal-ness of one who is persecuted and who nevertheless is not distressed, because she knows that it is the step that follows the one that requires attention and persistence. Brother, Sister: Indigenous, worker, farmer, teacher, student, homemaker, driver, fisher, cab driver, office worker, employee, street vendor, gang, unemployed, journalist, religious, homosexual, lesbian, transexual, artist, militant intellectual, activist, marine, soldier, athlete, legislator, bureaucrat, man, woman, child, youth, senior. Brother, Sister of the Indigenous National Congress, indigenous peoples of Mexico: We should not be here. After hearing this, I'm sure that, for the first time, those behind me are applauding furiously. For this reason I'll repeat myself. We should not be here. The ones who should be here are the indigenous Zapatista communities, their 7 years of struggle and resistance, their voices and their faces. The Zapatistas, the men, women, children and seniors, bases of support of the Zapatista Army of National Liberation, who are the feet that we walk, the voice that we speak, the face that makes us visible, the sound that gives us our voice. The ones who should be here are the insurgents, their persistent shadow, their quiet strength, their risen memory. The insurgents. The women and men who are the regular troops of the EZLN and who are the guardian of the heart of our peoples. It is they who deserve to see all of you and hear all of you and speak to all of you. And we are here with those, with all of those who people the indigenous peoples throughout Mexico. The indigenous peoples, our most first peoples, our most first speakers, our most first hearers. Indigenous Brother, Sister: Tenek. We come from very far. Tlahuica. We walk time. Tlapaneco. We walk the earth. Tojolobal. We are the bow and arrow. Totonaco. The walking wind. Triqui. We are the heart and blood. Tzeltal. The warrior and protector. Tzotzil. The friendly embrace. Wixaritari. They think we are defeated. Yaqui. Dumb. Zapoteco. Silenced. Zoque. We carry much time in our hands. Maya. We have come here to name ourselves. Kumiai. We have come to say 'we are'. Mayo. We have come to be seen. Mazahua. We have come to see that we are seen. Mazateco. Here our name is said by our walking. Mixe. We are this. The one who grows between fences. The one who sings. The one who cares for the old word. The one who speaks. The one who is of corn. The one who lives in the mountain. The one who walks the earth. The one who shares an idea. The true us. The true person. The ancestor. The person of the web. The one who respects history. The one who dresses humbly. The one who speaks flowers. Who is rain. Who has knowledge to give. Who hunts with arrows. Who is the river. Who is the desert. Who is the sea. The different. The one who is a person. The one who walks faster. Who is the people. Who is the mountain. Who is painted with color. Who speaks the truth. Who has three hearts. Who is father and elder brother. Who walks the night. Who works. The man who is man. The one who walks among the clouds. The one who has words. The one who shares blood and ideas. The child of the sun. The one who goes one and another way. The one who walks in the mist. The one who is mysterious. The one who works the word. The one who orders in the mountain. The one who is brother, sister. Amuzgo. All this says our name. Cora. And it says more. Cuicateco. But it is hardly heard. Chinateco. Another name used to strike at ours. Chocholteco. We are here to be with those who are us. Chol. We are the mirror through which we are seen and are. Chontal. We, we who are the color of the earth. Guarijio. From now on, never again ashamed because of our skin. Huasteco. Language. Huave. Dress. Kikapu. Dance. Kukapa. Song. Mame. Height. Matlatzinca. History. Mixteco. From now on, no more shame. Nahuatl. Here, from now on pride in being the color that we are, the color of the earth. Nahnu. Here, the dignity that is to see us being seen to be the color that we are, the color of the earth. O'Odham. Here the voice from which we were born. Pame. Here, from now on, never again the silence. Popoluca. Here, from now on, the shout. Purepecha. Here the place that was hidden. Raramuri. Here the dark light, time and feeling. Indigenous brother, sister: Non-indigenous brother, sister: We are here to say that we are here. And when we say 'we are here', we are also naming the other. Brother, sister who is Mexican or not. With you we say 'we are here' and we are here with you. Brother, sister, indigenous or no: We are a mirror. We are here to see and be seen, for you to see us, for you to see yourself, for the other to see himself in our image. We are here and we are a mirror. Not reality, just a reflection. Not light, but just reflected light. Not the road, but just a few steps. Not the guide, but just one of many paths which lead to the morning. Brother, sister City of Mexico: When we say 'we are' we also say 'we are not' and 'we will not be'. Because of this it is good that, those who are above are money and those who speak for it, take note of these words, pay attention and listen and carefully look at what it is that what they are looking at doesn't want. We are not those who aspire to power, and from power, impose the way and the word. We will never be. We are not those who put a price on our dignity or the dignity of others, and change the struggle to the market where politics is what merchants, who dispute not over projects but clients, want. We will not be. We are not those who seek an apology and a limousine from someone who pretends to help but is really buying and who is not apologizing but humiliating one who, by existing, claims, demands. We will not be. We are not those who, foolishly, hope that from above will come the justice that can only come from below, the freedom which can only be won with all, the democracy which is struggled for at all levels and all the time. We will not be. We are not some fleeting fashion which, when it passes, will be stored in a calendar of failures for the country to look on with nostalgia. We will not be. We are not the slick calculus which pretends in the word and hides a new pretense in it, we are not a phony peace which yearns for eternal war, we are not one who says 'three' and then 'two' or 'four' or 'all' or 'none'. We will not be. We are not the morning's regret, who becomes an increasingly grotesque image of power, who pretends to 'good sense' and 'prudence' when there is nothing but a transaction. We will not be. We are and we will be one more in the march. The march of indigenous dignity. The march of the color of the earth. That which uncovers the many Mexicos which hide and hurt under Mexico. We are not their microphone. We are one voice among all these voices. One echo of the dignity that is repeated through all the voices. We add our voice to these, we multiply our voices with them. We will continue to be an echo, we are and will continue to be a voice. We are a reflection and a shout. We will always be. 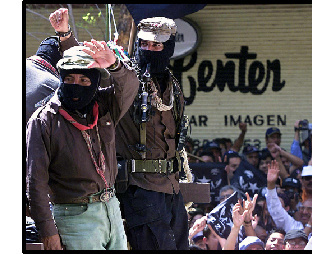 We can be with or without a face, armed or without fire, but Zapatistas we are, we are and we will be forever. For 90 years, the powerful have asked those below them, to whom Zapata called: 'with what permission, senors?' And we, those from below, responded and respond: 'with ours.' And with our permission, starting exactly 90 years ago, we shouted, and they called us 'rebels'. And today we repeat: we are rebels. We will be rebels. But to be that we want to be that with everyone. Without war, as a place and a way. Because so speaks the color of the earth: struggle has many paths, and only one destination: to be the color with all the colors that dress the earth. Brother, sister: They say up there above that this is the end of a tremor. That everything will pass and leave them above us as before. They say that you are here to see a show, to hear without even listening. They say that we are few, that we are weak, that we are not more than a photograph, an anecdote, a spectacle, a perishable product soon to reach its expiry date. They say that you will leave us alone. That alone and empty we will return to the land we came from. They say that forgetting is failure and they hope you forget and fail. They know but do not want to say: there will be no forgetting and there will be no defeat of the color of the earth. They do not want to say this because to say this is to acknowledge it and to acknowledge it is to see that everything has changed and it has not changed for nothing but because everything changes changing. This movement, of the color of the earth, is yours and because it is yours it is ours. Now, and this is what they fear, there is no 'you' and 'we' because we are all the color of the earth. It is time that the Fox and those he serves listens and listens to us. It is time that the Fox and those who give him orders see us. Our word says only one thing. We seek only one thing. Constitutional recognition of indigenous rights and culture. A dignified place for the color of the earth. It is time that this country stop being a shame clothed only in the color of money. It is the time of the indigenous peoples, of the color of the earth, of all the colors of below we are and we are these colors in spite of the color of money. We are rebels because it the earth is a rebel to those who would sell and buy as if the earth did not exist, and as if the color of the earth, our color, did not exist. Mexico: We did not come here to tell you what to do, nor to guide you in any particular way. We came to ask you humbly, respectfully, for help. That you do not permit the sun to rise without this flag having a dignified place for us who are the color of the earth. Read Rick Mercier's article. "Zapapalooza."